SmartAsset released their third annual study of the best cities for conferences, ranking Columbus #6 on the list. The rankings are based on availability of hotels, hotel room rates, the average cost of a restaurant meal, proximity to a major airport, violent crime rate and the concentration of bars, restaurants and other entertainment establishments. 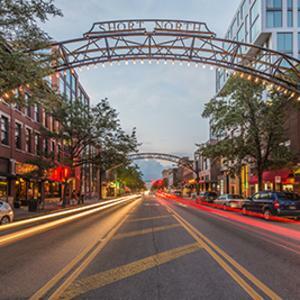 “Columbus is the only Midwestern city that cracks the top 10. If you’re supposed to attend a conference in the city, don’t worry about running out of things to do in your spare time. In fact, according to the Census Bureau, Columbus has a higher concentration of dining and entertainment establishments than San Diego or Orlando. As the 15th largest city in the U.S., Columbus has all the amenities you need at a better value. Hosting a meeting or convention downtown gives you easy access to all our hip galleries, shops, nightlife, attractions and dining just steps from the Greater Columbus Convention Center (GCCC). 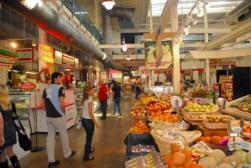 There are more than 100 restaurants within walking distance of the GCCC, including the North Market public market, so you will never go hungry or thirsty. You can jump on the CBUS right outside the GCCC to explore Columbus’ unique neighborhoods from the Short North Arts District to the Brewery District and German Village. John Glenn Columbus International Airport is just 10 minutes from downtown and offers 33 non-stop destinations. 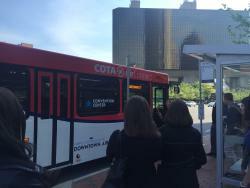 AirConnect, a circulator route to/from John Glenn International to downtown Columbus makes it easy to get to the GCCC and many of the downtown hotels. If you’re ready to see what all of the hype is around hosting a meeting or convention to Columbus, view our Venue Search to find a hotel or facility that meets your requirements, and then contact us to set up a personalized site visit.